Doors open at 8:00 PM, Show begins at 9:00PM. Your final tax deduction of 2018. 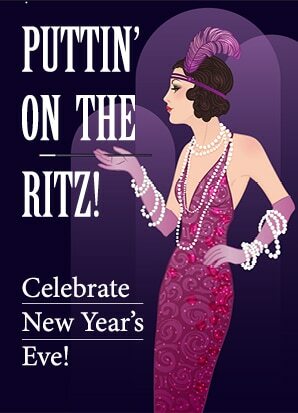 The Sunset Fundraiser - PUTTIN' ON THE RITZ! Dress up in your holiday finery and join us for a gala New Year's Eve celebration in Sunset's Studio Theater. Hostess Becky Spice and her special guests will sing holiday favorites and the classic standards you love. Seating limited to 88 guests. Performed in the Studio Theater.